Jeff Trout, Mike’s father, never made it to the majors. But he was a baseball star in his own right until injuries derailed his career, and if we better understand his excellence, we can better appreciate his status as the evolutionary link to a legend. “I can tell you I wasn’t nearly as good as my son,” Jeff Trout says when I ask him for a self-scouting report. After giving countless interviews in talking-about-Mike mode since his son became the best player in baseball, Jeff redirects reflexively. In addition to being the best at baseball, Mike is also the best at bland answers, so if you want to know more about the reigning MVP, his father might be the best person to talk to. But Jeff, 54, is more than a Mike Trout interpreter: He is, literally, the evolutionary link that leads to a legend, the bridge in the fossil record between normal humans and a pure baseball being. Jeff defaults to self-deprecation when asked about himself, but he was better at baseball than he would have most believe. We like to tell two stories about our sports stars. First are the stories about the preternatural talents who were always the biggest and best, the ones who might as well have been born with “Wonderboy” etched on their umbilical cords. Those are the stories that make us marvel at how far removed we mortals are from the physical outliers, too outclassed to be envious. Second are the stories about late bloomers — the athletes who were once undersized or awkward, who played JV because they couldn’t crack varsity, who always had doubters before they broke through. Those stories inspire and motivate us, make us reexamine our assumptions, often offer false hope. Mike Trout’s origin story combines both narratives. There’s plenty of preternatural talent: Mike, who’s hitting a typically brilliant .289/.396/.562 this season, was always large and strong and unfairly fast for someone his size. “As soon as he stepped on the field at a T-ball game, it was evident who the best athlete on the field was,” his father says. Mike batted .356 with patience and power in rookie ball before he turned 18, and .341 in Class A in his age-18 season. He was one of the two best prospects in baseball at 19, and the best player, period, at 20. But there’s an underdog element, also: He was only the 25th player picked in the 2009 amateur draft. Had the draft order been different, Mike’s success might have seemed more preordained. The Angels and the Yankees both appraised him as the no. 2 talent available, after Stephen Strasburg. But they didn’t pick until the 20s, and the teams that picked ahead of them had their eyes on other players. On the day of the draft, Mike — the only potential draftee to appear in person — sat in an MLB Network studio, posing for pitying reaction shots on the live broadcast as commissioner Bud Selig emerged over and over from backstage like a broken Bud-in-a-box, pausing at the podium to call the names of players who still haven’t made the majors: Donavan Tate and Matt Hobgood, Matt Purke and Bobby Borchering, Chad James and Jiovanni Mier and Jared Mitchell. We know why other teams were wary of Mike. It wasn’t because of big bonus demands: His $1,215,000 price was the 32nd-highest, behind those of 22 of the 24 players picked ahead of him. Nor was it because of makeup concerns. 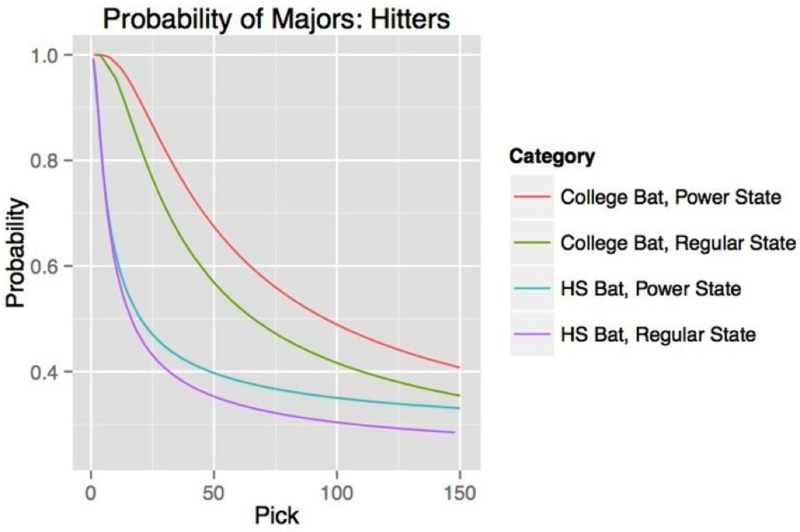 The answer lies in a recent draft study done by Daniel Meyer1 that shows that high school hitters from “regular” states — those aside from warm-weather powerhouses California, Texas, Florida, Georgia, and Arizona — are the least likely selections to make the majors. Mike’s late selection was the punch line to a New Jersey joke. 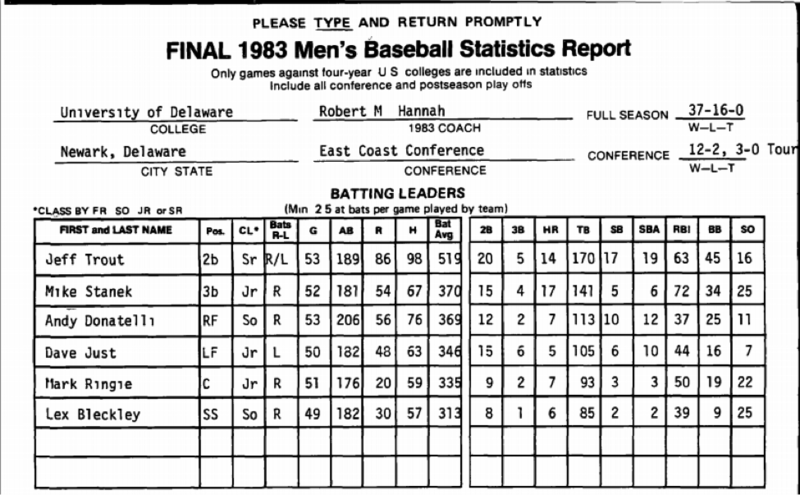 He came from Millville, where it was too cold to play baseball year-round, the competition was too inferior to allow analysts to trust his stats, and scouting directors had been burned before. Teams underestimated him because he had a humble beginning, demographically speaking. He fit the profile of a risky pick. That sort of story, about why someone was underestimated or slipped through the cracks, is usually easy to explain. The other sort of story, about why someone is incomprehensibly skilled, is more mysterious. Science has yet to sequence the genes responsible for producing the best player in baseball, and we know that world-class talent sometimes touches down in unlikely locations. But good baseball bloodlines make the complicated clear. Ken Griffey Jr. flows from Ken Griffey Sr.; Bobby Bonds begets Barry. The sons had three times the career WAR, but at least the fathers were close to the same extreme end of the athletic spectrum. Mike’s father is a small-town teacher, which makes his current occupation as akin to his son’s as Jonathan Kent’s is to Kal-El’s. (Superman has an inch on Mike, but they’re both listed at 235.) But before he went back to the books, Mike’s father played baseball. That much is well known: Many accounts of Mike’s early career mention that Jeff “made it to Double-A as an infielder with the Twins in the mid-1980s,” or that he “topped out at Double-A.” But while that’s true in the broad strokes, it leaves a lot unsaid. Jeff was much more talented than the typical hitter who plays professionally for a few years and then walks away, defeated. Upon closer inspection, his career makes Mike seem less like a black swan than a natural outgrowth of the Trout family tree. To put Jeff’s season in context, I asked Chris Long, the former senior quantitative analyst for the San Diego Padres and an expert in amateur draft analytics, to put the all-time leaders in college batting average on a level field. After applying some rough adjustments for home parks, road parks, opposing defenses, and seasonal run-scoring rates to the historical stats, he came up with the same four finalists, slightly rearranged. Of course, when you’re hitting above .500, additional at-bats are more likely to lower your average than they are to raise it. But there’s an important distinction between Jeff and the top three: He was a middle infielder, while the three hitters ahead of him played most of their games at the corners. In that sense, Jeff’s season was the most impressive. The Minnesota Twins liked him the most, taking Jeff with the first pick in the fifth round. After signing, Jeff, still at second base, hit .341/.399/.511 with eight home runs in 64 games in the Midwest League, besting the league-average OPS by more than 200 points. Only two other players hit .320 or higher in that league: Javier Ortiz, who posted a career .841 OPS in Triple-A and hit well in his brief big league time, and Wally Joyner, who went on to hit even better than Magadan in a career that spanned the same major league seasons. Jeff was slightly older than the average Midwest Leaguer, but nothing about his professional debut suggested that he wouldn’t be a big leaguer. But in pro ball, he began to break down. Jeff recalls tearing his plantar fascia landing on the first-base bag in his first pro season. “Then I tore, I think the same thing that [Bryce] Harper did to his thumb one of the years in Double-A,” he says, probably referring to ’85, when he played only 95 games. A football player in high school, he was also bothered by bad knees that eventually led to four surgeries (two on each knee), with the first coming a few years after retirement. He produced despite the pain, but the missed time may have held him back, and the prospect of not playing while battling ongoing injuries didn’t make Orlando’s routine eight-to-12-hour bus trips pass any more quickly. The final straw came in the spring of ’87. “After the spring training my third year, I got sent to Portland for Triple-A,” he says. “A couple of days through camp I got word that I was going to head back to Orlando, and I just walked away.” A combination of factors made up his mind. He’d gotten married, and he was ready to start making money instead of subjecting his family to the minor league lifestyle. He was banged up and tired of the bus rides, and he didn’t know how else he could prove himself to the Twins. “I didn’t see myself battling through it, being a minor leaguer for another two or three more years before I got a shot at the big leagues,” he says. “I thought I could hit big league pitching for sure, but it just didn’t work out that way.” And while he acknowledges that he “may have jumped out a little too early,” he says he hasn’t regretted his timing. In Jeff’s three Double-A seasons, he was teammates with Greg Morhardt, who later became the Angels’ area scout assigned to Mike’s region.6 Morhardt wasn’t tipped off to Mike early through his acquaintance with Jeff — he’d scouted him before he found Jeff’s phone number — so those Double-A seasons probably didn’t help determine Mike’s destination decades down the line, although it always helps scouts to have insight into a player’s parents. Scouting is a strange business: Five years after Mike’s signing (which should enable Morhardt to dine out for free in Anaheim indefinitely), and five months after Mike signed a six-year extension, the team let Morhardt go. (He now scouts for the Braves.) But given the years he spent scouting Mike and playing alongside Jeff, he’s probably the world’s best-qualified person to talk about Trouts. In retrospect, the Twins probably could have used Jeff, whether they knew it or not. Between Tim Teufel and Chuck Knoblauch, Minnesota went through an extended second-base dry spell. From 1986 to 1990, Twins second basemen — mostly Al Newman, Lombardozzi, and an assortment of forgettable infielders who got more opportunities than Jeff but never amounted to much — produced 3.2 WAR, tied for the second-lowest total among 26 teams. Morhardt suspects that the Twins were trying to put defense first, but if so, they weren’t succeeding. That’s the extended origin story of a superstar, as potent as a spider bite or the light from a foreign sun. Mike’s baseball skills come from Jeff’s side of the family: Jeff’s father was a fine high school player, and his grandfather was good enough for a nickname. “His nickname was ‘Bat’ Trout,” Jeff says. “They called him that because he was the best left-handed hitter in South Jersey.”7 The size comes from Mike’s mother’s side: Debbie, a swimmer and softball player, has five football-playing brothers who are all over 6 feet. “Mike’s a little bit more fluid than Jeff, but the same type of core athleticism was in both of them,” Morhardt says. It’s probably callous to talk about the elder Trout as if he were the product of a faulty design that was perfected in the next iteration. It would be, anyway, if that weren’t exactly how Jeff talks about himself — with considerable parental pride. Whatever existential angst or inferiority complex a father feels the first time his son stuffs him in a pickup game, Jeff has experienced far more acutely. If he feels any bitterness about the fact that the magic genes just missed him, though, no one would know. Instead, he’s grateful to have gotten the wish any father has for his son: to inherit all of dad’s best attributes and none of his worst. Jeff is the base model, and Mike is the fully tricked-out ride. “I stressed,” Jeff says. “I would go 0-for-4 and I couldn’t sleep. I battled those demons. It was hard for me to shake off a bad at-bat or an error in the infield. I really, really overthought the game at times, was very introspective about the game. Some of the things I struggled with I tried to give to [Mike] and teach him that’s not the way it should be done. He’s not real introspective. He can shake a bad game off.” That difference leads Jeff to conclude, “[Mike] didn’t get his makeup from me.” But if Mike’s quick stroke and muscular build come from Jeff’s genes, amplified and enhanced by Debbie’s, then maybe perfect makeup is the superpower he owes to nurture, not nature. And if so, then Jeff’s failure to become a big leaguer, despite his MLB-caliber skills, may have helped him mold Mike’s raw materials into their most refined form. Thanks to Alysha Tsuji for transcription assistance. Based on the first 150 picks of the 10 drafts from 1997 to 2006. He was also an “outstanding student,” befitting a future teacher. If Mike had somehow slipped beyond the second round, he was going to go to college at East Carolina. I ask Jeff to estimate how his son would have hit in Division I. “Can you imagine? Oh my gosh. It would’ve been crazy,” Jeff says. The average runs per game from 1970 to 2013 was 6.16, so scoring was slightly elevated in 1983. In his first three minor league seasons, Jeff was managed by Charlie Manuel, who declined an interview request because he’s busy trying to help the Phillies avoid another amateur draft disaster. Please sign my petition to bring back this nickname.